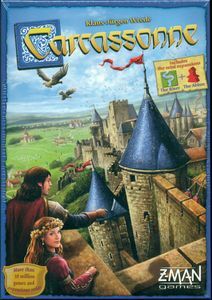 Carcassonne PriceCompare, Buy this board game at the Lowest Price. Carcassonne is an elegant game with plenty of room for creativity. It's easy on the eyes, has so few rules, and so few pieces. This game is super easy to learn, but like Othello, it could take a lifetime to master. Carcasonne's main theme centers around the design of a series of medieval towns, and populating the geography with various types of workers. Players score points when a city, road, or other completed community project has one of their citizens on it. Because the board is constructed by players through a random draw of tiles - no game is the same. In fact, a great deal of the game's enjoyment stems from the colorful layout of Carcassonne's randomly picked, but yet carefully placed cityscape. Players stack and shuffle the square board pieces and blindly draw them one-by-one. The pieces contain a combination of roads, farms, churches (cloisters), or city walls. After a draw, the player decides how to best use their piece to grow the expanding cityscape. The placement of the piece must make logical sense given the board's current layout ; roads cannot dissolve into a open meadow, city walls must align, etc. Early moves impact the cityscape for the rest of the game, and a cunning player can direct the flow city to their personal advantage, or use the piece to cut-off an expanding farmland or city in an attempt to impeded the growth of an opponent. After the piece has been set, that player may chose to place one of their workers on any region of the piece. Most pieces have two regions, though some have three. Workers placed on incomplete roads become thieves. priests are placed on cloisters, Knights reside in cities, and farmers work the fields. The player's piece pool contains a set of generic pieces -- they aren't farmers, knights or thieves themselves, but become these various occupations depending on where they reside within the expanding cityscape. A worker score points only when its project is completed. A road is complete when both directions have been capped by intersections, a city is complete when its walls come full circle, and a cloister is complete when it's surrounded by eight other tiles. Once a worker's project is completed, and points are scored, he's returned to the player's worker pool. Farmers are treated a bit differently. Once placed, a farmer works his field until the end of the game, at which time he scores points for every completed city that his farm is adjacent to. Farmers can really bring in the harvest if used wisely since any one game could have numerous cities. However, their placement is almost always a gamble; the Farmer is permanent loss to a player's worker pool for the rest of the game. Here's the kicker to the game - a player cannot place a worker on a already occupied unfinished construct. If Player A places a piece that extends a road, as a rule he can't place a Thief on that road if Player B already has a thief on another section of that same road. Makes sense, right? Players lay-claim to potential city constructs and work to complete their constructs. If the rules allowed another player to swoop-down at the end of construction and place a citizen on the same construct (this hypothetical road, for example) to score some quick points, then that action would seriously undermine the time invested by another player -- no one would risk building any large-scale projects. The game simply rocks. It's quick. It's fun. It's colorful. It's creative. It's all these things, and there's subtle strategy to boot. Take the rule mentioned just above - 'A citizen cannot be placed on a construct already occupied by another citizen.' All fine and good, with seemingly one dimensional implications. However, there's no rule against placing two citizens, each on a disconnected segment, and then on a future turn place a piece that connects the two segments. Boom! Instant double points. And when it comes to farms that lie adjacent to multiple cities, a sneaky forward-placement of a farmer can multiply scores, and make all the difference when the final score is tallied. We've played many, many games of Carcassonne. Each time the cityscape looks different from the last. Towns flow over the fields in various shapes an sizes. Roads meander here and there, connecting cloisters to city gates. It sounds dorky, we know, but boardgames usually don't look this cool. Our one criticism about Carcassonne is that it doesn't scale well. The game caters up to five players, but anything beyond three players is pushing the envelope of the amount of 'play' each person has on the city. And that's saying something since this entire game is all about the tile placement. In the end this title up roses. At age 75, and sometime in the afternoon after 4:45 (just after we finish dinner) you'll probably find us retreating to 'the home's rec room for some sparkling grape juice and Carcassonne. This game has staying power, and demands a seat atop anyone's game collection.